Sri Brahma Samhita is an Hindu scripture dedicated to Bhagavan Srihari Vishnu and it was discovered by Caitanya Mahaprabhu. Bhakti of Sri Krishna is the main theme of the book. 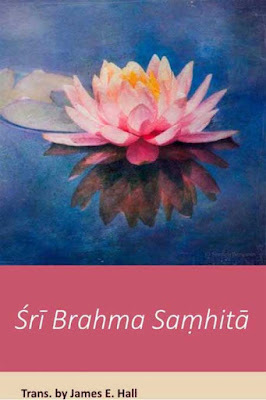 James E Hall has translated the Sri Brahma Samhita into English. There is also a simple commentary. To know more about the book, I did an interview with Author James E Hall. You can learn more about the book through the interview. There are several other Hindu scriptures dedicated to Lord Krishna but you chose Brahma Samhita to translate. Why? It was very influential to me personally in my own spiritual development — while I was well-versed in Hindu scripture before reading it, the Brahma Samhita, as well as various other texts associated with Gaudiya Vaisnavism gave me the idea of worshipping God in separation, rather than pursuing the idea of dissolution into Brahman — I related this to the relationship between partners which was formational in developing my concept of marriage. The book also does not have a lot of academic study, nor a lot of study by devotees. Very little is actually known about the text, including its history and origin, and there is very little formal or published study on the work and there are very few translations. Many seem to believe that it is a complex philosophical work, which was supported by Prabhupada. It is actually a devotional text and is quite simple, both in terms of language and ideas. During my study of the original Sanskrit I decided that it would be beneficial to others to help them discover the simplicity and beauty of its message, without the philosophical baggage and poor translation skills of some of the translators who came before. Thakura’s translation is not only biased philosophically towards the teachings of his own lineage, rather than looking at the inspired words of the original bhakta who wrote it and the intended meaning that was passed down from Krsna, but he was also very misogynistic (similarly to his most well-known student, Prabhupada) — Thakura seems to have been afraid of ideas surrounding love between people, as well as procreation and the continuance of life in this universe, which is an obvious bias to both his translation and commentary. Another of my motivations in translating this work was to ensure that others are able to read and appreciate the beautiful message from Krsna that was captured by the original author. There are some controversies surrounding Brahma Samhita regarding its antiquity; and whether such a text really existed before Sri Chaitanya Mahaprabhu. Did it in anyway influence you or affect you? It is certainly not an ancient document. It is clearly classical Sanskrit, and probably in the latter period of the development of the language. Sanskrit evolved over time as a written language and eventually lost touch with the spoken language, as the writers enjoyed clever language and using multiple meanings within the words and texts. While this was common in other forms of literature, such as drama, it also shows up in spiritual texts, as well — however, instead of puns, the writers focused on using multiple layers of spiritual meaning. No one seems to know for sure if there is really a larger work that the book is drawn from — however, it was certainly not written by Caitanya Mahaprabhu. While I believe that some of Caitanya’s messages may be slightly different than what is communicated in the West, due to the fact that those translating works associated with his lineage seem to be very philosophically biased and lacking in formal linguistic education or even traditional education as Vaisnavas, there are many signs that the work probably came before his discovery of the document. The actual Sanskrit text is very consistent with Ramanuja’s theology, which is slightly interesting considering it was discovered in the same area where he was born — however, I believe that once you look past any differences in terminology, Ramanuja merely represented the traditional Vedic point of view. The starting verse of the Brahma Samhita is quite different from other Hindu scriptures. It has a monolithic tone – to see Krishna as the only God. Sanatana Dharma teaches to see God in various forms and manifestations not in a Single Form. A devotee reaches the level of Brahman realization that there is only one Supreme Truth through negation. The devotee finally sees Supreme Truth in himself and the same in all animate and inanimate. If someone asks you is the current Brahma Samhita a propaganda text of Gaudiya Vaishnavism how will you react. Many traditions within Hinduism, or the Sanatana Dharma, have chosen one of the names of God to represent a Supreme Deity, and tend to associate this deity with both Isvara and Brahman. Subramuniyaswami’s Saiva tradition does this with Siva, and the Gaudiya tradition does this with Krsna — and I believe that Saktas have a similar point of view. However, no matter which name one uses, the perspective on the universe and God is pretty much the same. The Trimurti is best understood in traditional Hindu terms, but with the knowledge that any murti or name of God is representative of an aspect of the universe overall, and not a separate deity. Thakura’s translation does acknowledge the references within the original Sanskrit to the various other names of God that are mentioned in the original text, despite having a Gaudiya frame of reference. Many seem to confuse mythology with theology, which is very much present in particular in Prabhupada’s commentaries, including, if not especially, the Bhagavatam. Gokula is described as the lotus-shaped hexagonal abode of Sri Krishna in the text. Is this heaven or the place that each individual yearns to reach through prayer and spiritual study? Gokula is the more material version of Goloka. Gokula is the world we live in, but it may take a certain level of appreciation of God in order to see that we live in Gokula. Mythologically, it is associated with the island of Svetadvipa, which is a reflection of Goloka and was populated with jnani’s — it takes a certain level of jnana to understand that we live in Gokula. Many confuse the term jnana, or jnanam, with the idea of intellectual knowledge and learning, but it is in fact the intuitive understanding of God, rather than intellectual understanding or learning — the word is frequently mistranslated in English, and as many are aware, many Hindus are reading their Sastras in English. At least one traditional view of jnana would equate it most to the word gnosis, which is also frequently misunderstood by those in the West, with similar misunderstandings. While we do live in Gokula, I believe it is probably possible to reach Goloka, as well in this lifetime, but that is something I am still searching for myself, even if I believe it may be attainable. One of the messages within the original text of the Brahma Samhita is that we must search for enlightenment together (between soul mates) and that bhakti is the preferred path for doing so. Goloka could be the afterlife we experience after being freed from samsara — that is something we will never know until we reach it, but there is no reason to believe that which exists above does not also have a reflection below. A couple of verses in the Brahma Samhita try to imagine the world of Krishna. Numerous minute details are given. As a devotee it mesmerizes you. We yearn to reach that world in human form. Do you believe intense Krishna bhakti will transport us to that world? Many of the descriptions as translated by Thakura do not properly capture the beauty of Krsna, unfortunately. Part of this is philosophical bias, and part of this is because he was not a poet. It requires a poet to translate poetry, one cannot do it purely by translating the words into another language — and he does add quite a bit of material in the translation and commentary that does not exist in the original Sastra. I do believe that bhakti is the path that transports us to the world of Krsna — as stated in the text, bhakti anoints our eyes with oil and we begin to see with the heart — and it also states that bhakti is the preferred path to enlightenment, in particular when practiced with our spouse and Krsna together. Something that is missing from the other translations is that the original Sanskrit describes the continual creation, preservation and dissolution of the universe through the love affair between the male and female halves of God, as well as His love affair with man — I hope that others appreciate the fact that I captured this original story and message that is inherent in the original text in this poetic translation of the Brahma Samhita. The tone and nature of Brahma Samhita is very different from that of Bhagavad Gita. Brahma Samhita focuses on Krishna (Vishnu) and his abode and his glories. Bhagavad Gita solves problems in the world. Why do you think Brahma Samhita was lost in antiquity but Bhagavad Gita survived? I am asking this question because of 100 chapters of Brahma Samhita only the fifth chapter is available today. I believe that the Brahma Samhita provides a very short synopsis of the message of the Bhagavad Gita. There is a more concrete narrative to the Bhagavad Gita, which is determined partially based on the fact that it is contained within the Mahabharata — however, all of the core messages of the Gita are contained within and supported by the Brahma Samhita, especially the notion that there is only one God (no matter what His name is) and that bhakti is a preferred path to experiencing Him. However, the message concerning bhakti within the Brahma Samhita most accurately captures the concept of romantic love for God, which is inherent traditionally within most concepts of bhakti, but is described explicitly in the Brahma Samhita. To a person who has read Srimad Bhagavad Purana, what is there in Brahma Samhita that is not present in Srimad Bhagavad Purana? I think that depends in part on whether one is reading the Bhagavatam in English or Sanskrit. I have not personally done a lot of study yet on the original text of the Bhagavatam, however based on what I have looked at so far it probably has fewer issues in translation than do some of the other works published in the Gaudiya lineage. Both the Bhagavatam and the Brahma Samhita state (no matter which translation one reviews) that we will find Krsna through his grace and with His help and that the path is through bhakti — however, an additional message that is contained in multiple places within the Brahma Samhita is the idea that we should also be experience bhakti together with our spouse. Krishna Bhakti is the prime focus of Brahma Samhita. How can the text intensify Krishna Bhakti in a devotee? What are points that you think will make a devotee desire for more intense bhakti? I think the text can help to intensify bhakti by providing a very poetic and beautiful description of Krsna’s love affair with man and the universe, which serves as a model for developing our own romantic attachments, both to our partner and Krsna Himself. 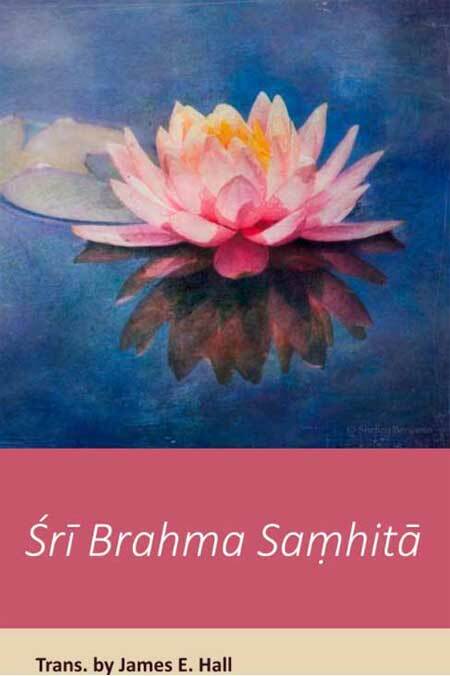 There are numerous translations of Brahma Samhita available today. What new insights does your book provide? I have probably described this a bit above, however any new insights would be that the text is incredibly simple and is devotional poetry, rather than a philosophical text — despite the fact that it does convey many important messages that are important to our devotional work. An additional insight that I hope all Hindu families take from the book is that it is really meant for the whole family — parents can use this Sastra with their children to give them an idea of what they can look forward to later in life and to help set them on a path to realizing Krsna in this lifetime. Hindu scriptures provide sparks. Hindu scriptures want the reader to think and find out more. The devotee should use each spark to light his own fire. What are the kinds of sparks that you found in Brahma Samhita. 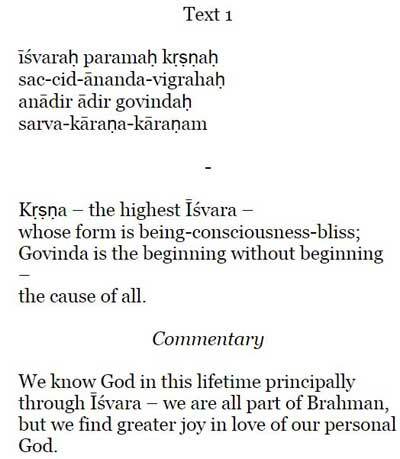 The book describes God’s love affair with man — it also describes jnana, and that we can experience jnana through bhakti. It also tells us that we should experience bhakti through and with our partner — we can find Krsna in our spouse, and together we can find Krsna outside of the relationship, as well. There is also an album based on the Book. Could you tell something more about it? Your book is a courageous effort to study and translate a Hindu scripture. What was your main guide and inspiration? My main guide is a love of Krishna, as well as my soul mate. I also hope to help others in their own journey by letting them know what the message is (and language) of the original Sastra. Majority of Hindus do not have time to study even popular Hindu scriptures. So how come you have such deep and keen interest in Hinduism. That is a long story that is touched on in the forward to the book — however, I developed a love of God at an early age and also have a history as a published poet and many years of experience in linguistics, in addition to being a devotee. I go to amazon, other online stores, or to a bookstall and I see Brahma Samhita by James E Hall and I buy it. Why do you think I bought the book? What could be the one reason to add Brahma Samhita by James E Hall to my collection of Hindu scriptures? The reason anyone should get a copy of the book is because it captures the meaning of the original text very well, is extremely short and provides a synopsis of all of the Sastras that came before — it is very approachable, extremely easy to read and is a great tool for families to use, both in potentially gaining a greater appreciation of their partners, as well as providing assistance in instructing their children on the easiest path to knowing God. The book is currently available on Kindle and on Amazon.comin paperback. You can also know more about and contact translator and commentator James E Hall here on his facebook page.